If human physical capabilities can never compete with automation in efficiency and consistency, how should we assess the benefits of making an object, a piece of art, a car, by hand? Clay Jeter’s Takumi: A 60,000 hour story on the survival of human craft, premiering at this year’s DOC NYC, explores the nature of craftsmanship in Japan, and the dedication and commitment that accompanies the title of takumi, or “artisan.” This film is not only about the difficult process of making something by hand, but is a larger exploration of the tension between traditional and contemporary values as technological advancement threatens to further outpace human beings. Although the film concentrates on Japan in particular, it addresses a broader trend, namely a modern obsession with speed and brevity. Our short attention spans and demand for instant gratification are often in conflict with the nature of individual mastery, which requires thousands of hours of practice and study. This film posits, however, that the possibilities of human craft have the capacity to push innovation forward, and that technological advancements and human creativity are not as incompatible as it can sometimes seem. Takumi is a quiet, contemplative profile of craftsmen of the 21st century, and the way their commitment to traditional cultural knowledge and skills interacts with the overwhelming cultural demand for novelty. Takumi is beautifully shot and edited, and remarkably successful at drawing attention to its thematic throughlines using only visuals. Worn and often aged hands tell their own stories of time and commitment. Cityscapes in Japan show the way tradition and modernity connect and overlap. Narration from Neil MacGregor, along with interviews with academics in various fields, pepper the documentary, but most of the film is dedicated to the voices and work of the subjects themselves. There is a commitment, despite the film’s trim 58 runtime, to highlighting the details of the creative process, with reverence and respect. There is no hierarchy here: crafting buildings is just as inspirational, visually beautiful, and reverentially treated as cooking or traditional paper cutting. This film takes no simple stance, not admonishing technology or single-mindedly lamenting the death of handmade objects, but is more interested in showing the ways innovation and traditional craftsmanship can coexist if we nurture that relationship. 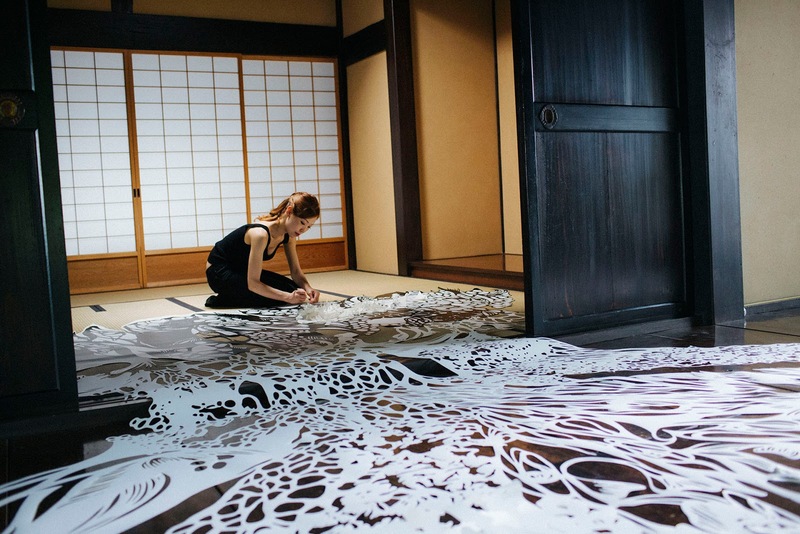 Nahoko Kojima, for example, a paper artist in the long-standing tradition of Kirie, has taken the seemingly unchangeable rules of the paper cutting art form and adapted it, adding innovative dimension and movement to a historically one-dimensional and static artform, while still maintaining the core values of the artistic tradition. There is the presence of individual human interaction at a Japanese Lexus dealership, the film shows, even among the automation and machines, as Katsuaki Suganuma examines finished vehicles with 32 years, over 60,000 hours’ worth of instinct, knowledge, and perception. It is this complex overlap of traditional values of mastery and skill and modern efficiency and technology and that makes the film most interesting. Takumi tells a varied story, and has something to say about futurism, human history, technology, art, cultural identity, and more, all shown to be connected to our approach to the act of making objects. Contemplative, convincing, varied but thematically cohesive, beautifully shot, Takumi is a beautiful profile of craftsmen, as well as a moving defense of tradition, cultural knowledge, and human creativity, and the ability of human beings to create and connect in a way that machines, on their own, cannot.